1 big thing: Michael's "unimaginable devastation"
Hurricane Michael's startling savagery has so far resulted in six confirmed dead, and the devastation will be hard to forget. The big picture: The post-storm footage is so awful that it would be astonishing for the toll to remain so low. Drone footage showed entire city blocks leveled, reminiscent of Tornado Alley towns after an F-4 or F-5. Roads are closed and power is out for more than a million in the southeast. The N.Y. Times from the scene: "Ted Carranza could only watch with horror and wonder as Hurricane Michael lifted the houses all around him in the small town of Mexico Beach, Fla., then spun them around and dropped them." "A National Guard team got into Mexico Beach and found 20 survivors overnight, and more crews were pushing into the area in the morning, with the fate of many residents unknown, authorities said." "State officials said 285 people in Mexico Beach had refused to leave ahead of the hurricane despite a mandatory evacuation order." "Gov. 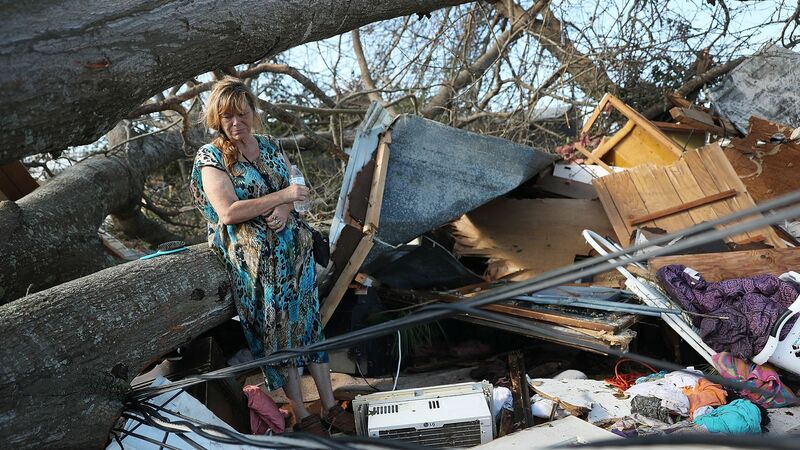 Rick Scott said the Panhandle woke up to 'unimaginable destruction... So many lives have been changed forever. So many families have lost everything.'" The Dow fell another 545 points today, after closing down more than 800 yesterday. The NASDAQ was in correction territory for part of today. Between the lines, from Axios' Courtenay Brown: This bull market has spoiled us. Pullbacks are normal (healthy, even), but they don't feel good because we haven't seen too many of them like this. Sure this could be the beginning of THE pullback, but that's not the sense I'm getting from a lot of strategists. A number of companies and individuals are backing away from Saudi Arabia until more answers are provided on the whereabouts of journalist Jamal Khashoggi. Go deeper. Michael Cohen today changed his party registration from Republican to Democrat. Go deeper. Kanye West had a roller coaster, 25-minute appearance in the Oval Office during a meeting with President Trump and former NFL running back Jim Brown, stating that Trump is on a "hero's journey" before ending things with a hug. Highlights. Facebook's purge: The company has axed 559 pages and 251 accounts, many of them hyper-partisan, that have demonstrated spammy behavior that violate its rules. Go deeper. John Brennan believes the debate over what China may be doing to "influence" or "interfere" in the 2018 midterm elections hangs on the meaning of those two words. Go deeper. Esports teams are turning to classic sports for inspiration on keeping their athletes in gaming shape, the WSJ's Timothy Martin reports. "To stay in the game, Dario Wünsch has adopted a dedicated routine to avoid injuries. He starts each morning with yoga poses, torso twists, finger stretches and planks. He gulps down ginger smoothies to ward off joint inflammations. And after every match, he ices his wrists." "Sweden’s Ninjas in Pyjamas... distributes an illustrated fitness guide to players with nearly two dozen recommended 'core' exercises like burpees, Superman lifts and squat jumps." "It has also instituted a 'no pizza' rule before morning matches and mandated teams take pregame walks." Hit the gym, then grab a controller.